Did you know that out of the 32 career World Triathlon Series races that Spaniard Carolina Routier has started in, she has led in the swim a total of 20 times? In fact, she has been leading in the swim ever since day one in the Series, exiting the waters first in her debut WTS race in Madrid in 2012. And for anyone who has been following this season’s 2017 Series she also has led in both events this year in Abu Dhabi and Gold Coast. So, while Routier cruises through the water unscathed as one of the top swimmers in the women’s field, it comes as no surprise that her triathlon career would have started in any other place other than in the water. Routier was a competitive swimmer for most of her life, but during her off seasons, she had to find a way to stay fit and as an active person she also needed something to keep her entertained. So she busied herself with sporting activities such as surfing, kayaking, open water swimming, lifesaving and eventually triathlon. It was then in 2009 when she competed in her first triathlon race, which was near her hometown in Costa Brava, Spain. A few short years later and Routier officially became an elite triathlete, joining the ITU world and competing at the highest level in the WTS. Fast forward a few more years and in 2016 she had the chance to represent her nation in Rio de Janeiro in her first Olympic Games. While her finish resulted in a LAP, her signature move was not lost and she once again proved that she is the ringleader in the water as she earned the top swim split time on the day in front of the world’s biggest sports stage. “Participating at the Olympics was always in my mind and qualifying was a dream come true. Although the result was not what I expected due to mechanical problems, I’m happy to say that I enjoyed the process towards the race and I feel very fortunate to experience it with Mario,” said Routier of her experience competing in Rio. 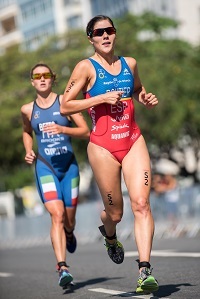 Routier shared her Olympic dream with her partner and fellow Spaniard triathlete Mario Mola. The two train together and travel to compete in almost all the same races, an experience that benefits their relationship when otherwise the world of a professional athlete could hinder personal relationships due to the hectic and busy lifestyle. And while Routier is lucky to have a partner like Mola to train with to improve her triathlon career, as he is the 2016 reigning ITU World Champion, it seems that it is also Mola that can benefit greatly from training with Routier. In the 2017 ITU WTS opening race in Abu Dhabi, Routier once again was the swim leader, exiting the waters at a time of 19:11 for the 1500-metre swim. As for Mola? His swim time was 19:12, meaning that in a head-to-head swim challenge, Routier still comes out on top. So what is Routier’s secret to her swim success? So while Routier continues to be the master of the swim, what many people do not know is that she is also working to complete her Master’s Degree in Communications. Studying to obtain a Master’s Degree takes time, hard work and a lot of dedication. Training and competing as a professional triathlete takes time, hard work and a lot of dedication. So how does Routier balance the two, while still trying to maintain a personal life as well? So as the 2017 season continues on, Routier the student will become a Master of Communications, while Routier the triathlete will continue being the Master of the swim and eventually working to improve as an overall athlete on the bike and run as well. Big things are ahead for the Spaniard and we are just lucky to be there to watch and cheer her on while they happen.